KoopaTV: Kimishima is out; Furukawa is in: Nintendo's Done with Fiscal Year Ending March 2018! Kimishima is out; Furukawa is in: Nintendo's Done with Fiscal Year Ending March 2018! By LUDWIG VON KOOPA - They're not only done (since March ended a while ago), but reported some information about it! It's Nintendo financial reporting time! This time, the fiscal year that went from April 2017 to March 2018 is over, and now we begin a new fiscal year of April 2018 to March 2019. Nintendo is projecting some mighty fine numbers for that. 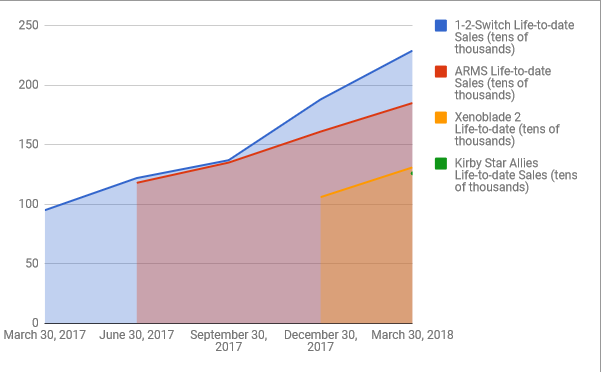 They have sold 17.79 million Nintendo Switch consoles so far... and now they plan to sell an additional 20 million by the end of March 2019, along with 100 million Nintendo Switch games. Super Mario Odyssey has sold an astonishing 10.41 million units, and Mario Kart 8 Deluxe has sold 9.22 million. By comparison, Mario Kart 8 on the Wii U has only sold a lifetime of 8.42 million units, and it was by far the best-selling game on the Wii U. My favourite, Splatoon 2, now has 6.02 million sales! Featuring 1-2-Switch, ARMS, Xenoblade Chronicles 2, and Kirby Star Allies. Somehow, 1-2-Switch got a boost from the holiday season, so people bought it for Christmas. Fortunately, no one bought or received ARMS as a Christmas gift. Here's hoping Kirby Star Allies overtakes ARMS three months from now! So, Nintendo and the Switch did very well. The 3DS still lives on by all of those remakes and ports announced in that March 2018 Nintendo Direct, though its forecasts are reduced significantly. 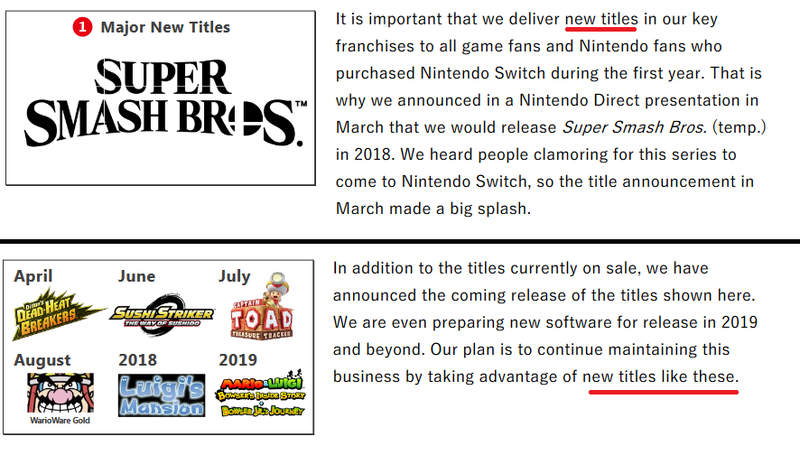 Kimishima described Super Smash Bros. for Switch as a major “new title”. 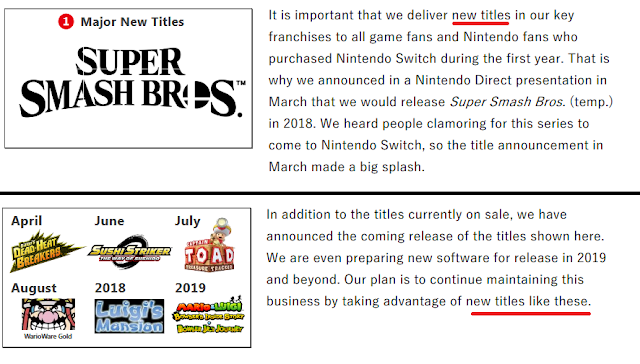 Kimishima also used the phrase “new title” to describe Captain Toad Treasure Tracker (a game released on the Wii U and then ported to the 3DS), a WarioWare microgame compilation of already-existing microgames, Luigi's Mansion (WHICH IS SEVENTEEN YEARS OLD! ), and Mario & Luigi: Bowser's Inside Story + Bowser Jr.'s Journey (originally on the DS). I'm maintaining my skepticism about the new-ness of Super Smash Bros. For Switch. Fortunately, we'll know for sure within a month and a half. I've mentioned Tatsumi Kimishima several times already — who is this Furukawa guy in the article title? He is Shuntaro Furukawa, and starting on June 28, 2018 (aka July), he will be the NEW president of Nintendo! We know almost nothing about him. His Wikipedia article was literally made just today. As you might expect, there isn't much there. He's only 46 and knows fluent English. A lot of media outlets are commenting about how young he is and how that's very significant, but I think they're just ageist. I'm hoping that Furukawa has a personality. I can't recall a single time we saw Kimishima actually present something in front of a camera. It's always through lower-level minions, unlike with Iwata. New leadership may also mean they'll double-down on this whole mobile garbage thing. They just announced Dragalia Lost, an action game for smartphones designed by Cygames for release this year. Sounds disastrous. We'll see. Do you have any secret knowledge about Shuntaro Furukawa? KoopaTV would love to be a cited reference on his new Wikipedia article, so if you have anything noteworthy, let's talk about it. In any case, there is a lot to unpack here in today's news, with lots not mentioned in this article, but KoopaTV is willing to talk about everything! This article is KoopaTV's 1,337th article, which is extremely significant. This is the article back when Kimishima was announced as the new president of Nintendo. Here is the 2017 version of this article, in terms of fiscal year timings. The article describing the previous quarter (October to December 2017)'s financial results can be found here. Reminder that Nintendo also considers Donkey Kong Country: Tropical Freeze on the Switch to be a new game. Kimishima and Furukawa team up for the ensuing questions and answers session! Furukawa is now the president! No one knows about him. One quarter later: Do we have answers to our sales questions? Despite being the shortest serving president, a lot was still accomplished under Kimishima's watch. It will be interesting to see if his successor can maintain the momentum moving forward. Also, is there a reason that the life-to-date sales for Kirby: Star Allies is not shown in the line graph? Kirby Star Allies is the tiny green dot on the very right of the chart area. Right below where Xenoblade Chronicles 2 ends.